What format is your data in? Check the file types that are supported in NVivo and try importing some of your material. Do you want to code content at themes? Explore nodes and coding. Do you want to compare comments based on demographic attributes? Take a look at cases and classifications. What sort of questions do you want to ask of your data? Check out queries and visualizations. 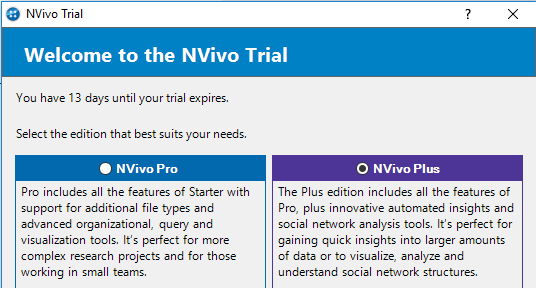 If you do go on to purchase NVivo, you can continue to work on any projects you create during your trial. There are two editions of NVivo (NVivo Pro and NVivo Plus) and you can try each of them out during your trial. The QSR website has detailed product information on each edition, including a handy Feature Comparison page. It's easy to switch editions. During your trial Each time you launch NVivo, you will see the NVivo Trial dialog. Select the edition that you want to use and then click Launch NVivo. At any time (during or after your trial) Go to File > Options then on the General tab, change the Edition. You'll need to close and re-open NVivo. Identify which edition you're using by the color of the status bar or Backstage view—just click the File tab at the top left of the screen. 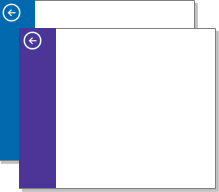 NVivo Pro is blue and NVivo Plus is purple. No data? No problem! You can still trial NVivo even if you haven't started collecting data. Use the sample project 'Environment Change Down East' to experiment with the features of each NVivo edition. Switch to NVivo Plus edition and use the 'Local Government Budget Consultation' project to see auto coded themes and sentiment. To see how many days are left on your trial, on the File menu, click Help and then click About NVivo. Once your trial period has ended, you can choose to purchase a license key and continue working on your project. You can access plenty of free resources from our website, or from the wider NVivo community. This Online Help—use the search function or table of contents to find out how to use NVivo. @NVivoSup on Twitter—communicate with the QSR support team and access quick tips and solutions. NVivo Blog—keep up with issues and trends in qualitative and mixed methods research. LinkedIn—join the NVivo Users Group and start a discussion or network with other researchers in your field. 1 Navigation View gives you access to items in your project. 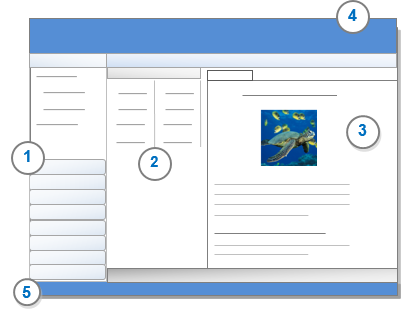 2 List View displays the contents of the folder you have selected in Navigation View. 3 Detail View displays the content of your project item when you open it. This might be a file, node reference or visualization. 5 The Status bar displays contextual information that varies depending on what you are doing in your project. Learning the language of NVivo can be challenging. What is a node? What is a file? What is coding? Get to grips with the words and key terms used in the interface. There are several things you can do straight away in NVivo to gain insights from your data. First you need to bring in your data—click the Import tab. Try running a text search query to find particular keywords or phrases. For example, find content where the terms rising sea level and property occur within 20 words of each other. Run a word frequency query on your focus group transcript to see what people were talking about most. Read through your files and create a mind map or concept map to model your data or record your hunches. Use NVivo Plus to automatically detect themes and sentiment in your files. The results might give you ideas about further questions to ask of your data. You can switch to the NVivo Plus edition during your trial. Coding is the process of gathering related material together—and is a fundamental task in most qualitative projects. In NVivo, a node is a virtual container that holds your coding. Nodes let you gather related material in one place so that you can look for emerging patterns and ideas. Open a document in NVivo and, as you read the content, ask yourself “What is this about?”. Select content, right-click then choose to Code the selection. There are many other ways to code including drag and drop, the Quick coding bar and the options in the Coding group on the menu bar. 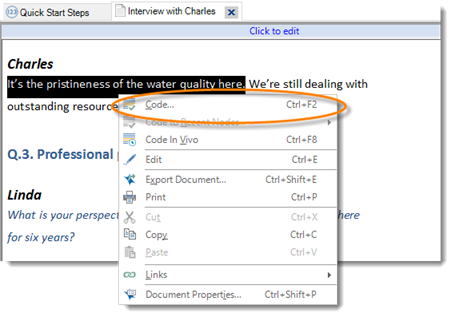 Make nodes for the themes that you find—for example, comments about water quality go in the Water Quality node. You can also create nodes to represent cases and relationships. What are coding stripes and why should I use them? Turn on coding stripes to see what you have coded. Click a coding stripe to highlight the coded content. Right-click on a coding stripe to find other options like Uncode. Open a node to see your coding—you can review everything about a topic in one place. For example, you can explore what everyone had to say about water quality. When you open a node, you can look at the node summary or move through tabs to see all the text, audio, video or pictures that have been coded at that node. Link the node to a memo that describes your analytical insights or 'code on' to other themes or topics.